My mother was a medicine doctor. She’d go out in the woods and get all the herbs and stuff to make medicine. I wasn’t but three years old. She would go around and get weeds and I’d go with her; sometimes two, three miles. She could heal people. I heal people myself. I take off warts. I don’t put nothing on them. I just take them off. They don’t come back. They be gone. I make stuff, too, from pine trees, oak trees, elm, hollywood trees. Boil the leaves, put whiskey in it, drink it. I got to playing in that old mud hole and painted a picture on a tree. And I’d go back to that thing, a half a mile, my mama didn’t know where I was, and I’d sit there and look at it. And it wash off. I was studying a way to make it stick. I couldn’t sleep at night for studying that stuff. I got nine years old. I was up there with a man making syrup and he dropped the syrup in the mud. I picked it up and felt that mud, and put it on the wall and it wouldn’t come off. The sugar is what held it there. I mixed the syrup and the mud and put it on a piece of wood. That’ where I got started. I wanted to make things after that. I had to make something. I got to where I couldn’t sleep. Old man come along, showed me how to make a baby foot; ball up your fist, that’s a baby foot. Went to work wherever I could—farms, Alabama Power; anywhere. Started back to painting in the sixties. Not on wood, on a piece of iron. Didn’t just use mud. Went out on the railroad track, pull that old rust off on the side, get it into water. I snuck out there. The Man might think I was going to put a bomb on the track. That piece of iron is around in that art building over there (in Fayette). I saw it just the other day. It was all there in the ground, every color of dirt and mud. I got twenty-three colors of dirt in my own yard. Walnut hulls and coffee grounds do good, too. Purple and red in the berries. Blackberries, pokeberries. Mash them with a stick. Soot, you can burn something, a heap of things, and get black. I was a boy, poured water on the coals in the stove and make pictures with it. All over the walls. Go to the barber shop and get the hair and burn it, looks like soot. Other people burn hair to keep the dead away (he laughs loudly). A woman wanted me to paint with blood, but I don’t do that (he grimaces). I thought about animal blood once, but I couldn’t get ready for that. Grass, weeds, turnip greens, pine needles can make green. Flour or plaster or chalk give you white. Don’t use salt; salt will take the mud away. He never wanted the store-bought art supplies, either; as he says, “My hands is my brushes. The brushes die when I die.” So he paints with his fingers, and on good days, his fingers are like a Zen calligrapher’s brush. He paints what he knows. The animals around him—chickens, cows, horses, snakes, an occasional alligator, his dogs. People he knew or saw. And the houses and public buildings of nearby Fayette. 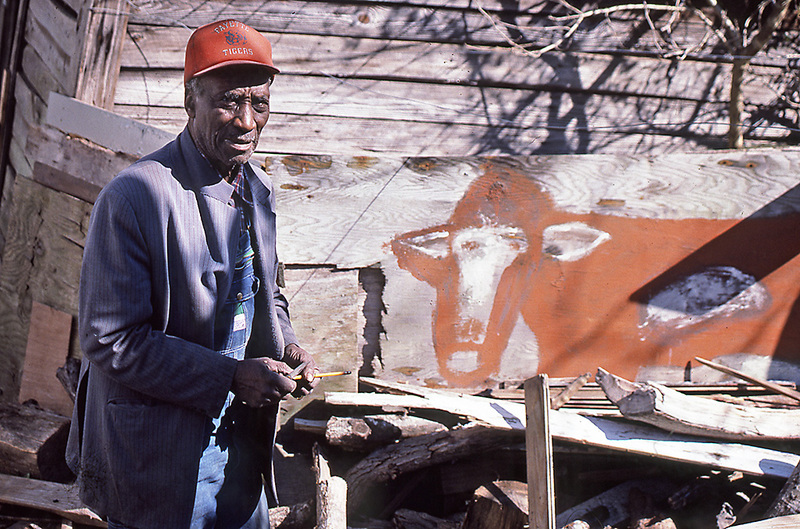 After he became known, he would be invited to the cities—Birmingham, New York, Washington, D.C.—to see his art being exhibited, and he created impressions of what he saw. He understood that nature, like the white man’s world surrounding him, could be a sympathetic and providing partner as well as a hostile adversary. So he gave it to us both ways. Toto, the frisky little dog that sleeps beside the artist’s bed, can appear in a painting to be sinister and menacing. The gigantic reptilian “dynalizard” of the artist’s imagination can be as benign as a child’s stuffed animal. There are also the mysterious and dangerous “swamp monkeys” that occasionally emerge from the woods at night near the artist’s home. “They are real, I promise you. Everybody around here has seen them. They come out and stand up on their hind legs near as big as a man. You don’t want to mess with them.” When they appear in the artist’s work, they strongly resemble . . . Toto. Friend or foe? The artist knows you never can be too sure. This applies to people, too: Is the figure on roller skates a woman heading for market, or is it the devil with a brown dress on? Is her left arm raised in salutation to a neighbor, or is she acknowledging a secret conjuring posture? The artist’s generation, and those that came before, had to develop their strategies for survival. Entertain. Don’t get caught thinking. So the artist became a minstrel. Trickster as minstrel. Minstrel as trickster. In every self-portrait—and there are too many to count—we see the minstrel/trickster. Casual, grinning, gaping, jiving, playing his guitar or his harmonica, entertaining. Revealing what he wants us to know; concealing the rest. Look at his buildings, his cities. They conceal much more than they reveal. Flat, like movie sets, they are imposing and forbidding, defying entry. Often there is no sign of a human presence, as if the buildings are untended mausoleums. Atlanta is a modern castle surrounded by a moat and drawbridge, its Georgia-Pacific skyscraper ablaze with lights at night, and empty. The Washington Monument is an imposing phallic symbol, the government’s ironic threat. Do blacks get to participate in the activities in and around these structures? Probably not. The artist shows us a world he spent most of his life viewing from the outside. He could pick its cotton, tend its gardens, cut its grass; but he could not drink from its water fountains or sit on its toilets. There are the toy-like busts of women, which he painted throughout the late 1980s. They unmistakably resemble the carnival dolls that regularly get knocked down and yet usually rebound. What kind of women do these painting represent? What observations are being made by the artist? He is not saying. Don’t let them catch you thinking. Now, in his eighties, he relaxes, speaks softly and openly among friends, some of whom may be white. Perhaps old age, or ill health, or his fame and the growing number of admiring customers have made him less guarded. The local whites are quick to point out that he has always had supporters among them. Yes, you did, Jimmy Lee Sudduth. You got it from the rocks and the dirt and the leaves and the soot. You got it from the syrup and the plaster and the rusty railroad tacks. You knew that you could not really rely on your neighbors or the townspeople or the government, but everything you needed for survival was right there, under your feet, behind your house, at the end of your fingers. That is, after all, what survival is all about. And it is also about keeping them guessing. Send them away happy, smiling, remembering the minstrel, thinking they understand what you’re talking, painting, and singing about. All the bread and cheese I had it laid on a shelf. I had to go to Baltimore to buy me a wife. I had to bring her back in the old wheelbarrow. The Devil got the wheelbarrow, wife and all. (And I didn’t have nairn a-tall). The rooster knocked the white man plum out of sight. He didn’t get back till the Fourth of July. And about that time I left. The quotations in this essay are derived from conversations that took place during 1987 and 1995. Jimmy Lee Sudduth's Lola Mae, My Friend provides another instance of the doubly signifying sacred, but this time in a trickster mode. Jimmy Lee Sudduth's Lola Mae, My Friend provides another instance of the doubly signifying sacred, but this time in a trickster mode. It is simultaneously eerie and playful; perhaps "spooky" is the right word, bearing the dual sense of the scary and the mischievous (as with poltergeists). The contorted shape of the figure suggests a repulsively inhuman ability to bend the body fluidly, as if every limb were double jointed. The balancing of an awkwardly attached hat on the figure's head is accompanied by a juggling ball in its hand and the improbable roller skates on its feet. The head of the figure appears hairless like that of a male (despite the title of the work), but is clothed in a skirt like a female, thus suggesting the multiple sexuality or the indifferent non-sexuality of a spirit being. Gender non-specificity is a tricky phenomenon, as many cross-dressers and transvestites demonstrate; such indeterminacy also conveys the possibility of a supra-human entity possessing obscure powers and intentions. The comic dimensions of this image do not render it less dangerous; it is only that the danger is presently impish rather than sinister. One would not be surprised by such a figure, however, if it proceeded to metamorphose into something less playful and benign—something more like one of Ralph Griffin's "Wizard" figures, for example, in which the presence of a spirit being is equally evident but whose motives and import are much more impenetrable. In this regard Griffin's wizards more obviously resonate with spiritual power to bless or curse, but tricksters can be healers/harmers, too, like the trickster orisha of the Yoruba, Eshu, or the African American folk trickster, High John the Conqueror. Sudduth's spirit figure is a fitting emblem for lighthearted clowning and fooling-around behaviors that are transformative in their own right. Homo ludens, the human being as player, has as much a role to perform as does homo sapiens (the knowing human) and homo faber (the making human). The most playful blues and jazz musicians understand the transformative power of a trickster performance, in which music outmaneuvers melancholy and other psychic distresses. "Spirit skates" with funny hats and juggling balls correspond to the performative tricks and paraphernalia by which our artists heal our souls and redirect our passions. No treatment of the transformative repertory of African American art would be complete without accounting for this playful dimension. Sam Doyle's dancing figure Rocking Mary, a bare-breasted and pipe-smoking female figure, is another playful specimen in the same tradition. Of course, the trickster can be manipulative and deceptive, too. Our experience of such duplicity is precisely why Sudduth's spirit figure is more than amusing: if we have experienced enough, we suspect that more than whimsy is signified in the agile twist of its torso and limbs.